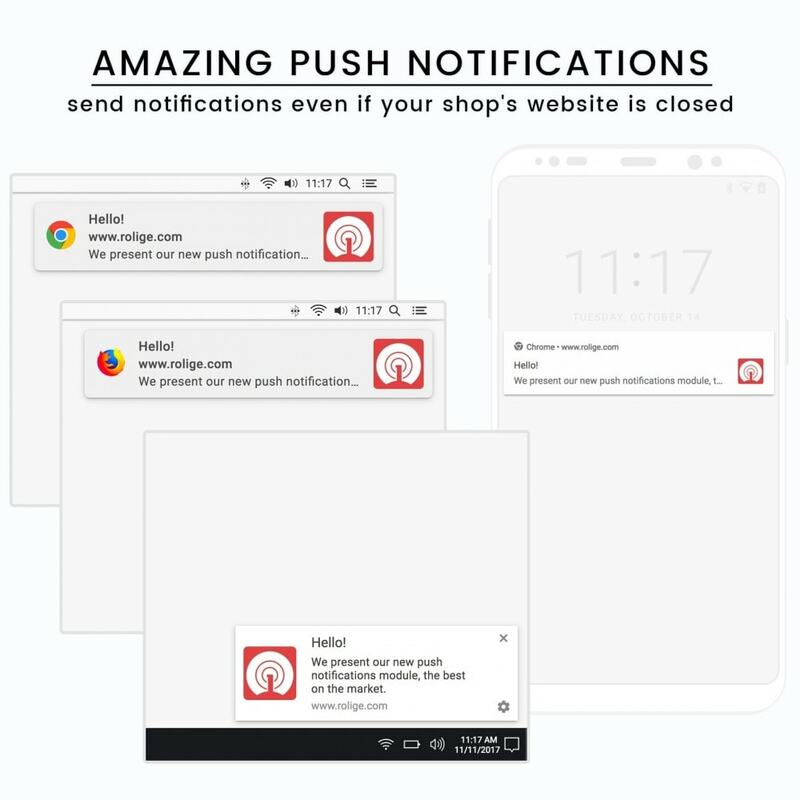 Send unlimited push notifications to web browsers in any device, even if your shop's website is closed, using advanced PrestaShop based segmentation filters. Easy to use and with advanced functionalities. Sending notifications even when the users are not on your website helps you stay top of mind with users, especially if they've previously engaged. Web push notifications work exactly like the native mobile push on Android, so you don’t have to create a mobile app to send native push notifications. Greater opt-in rate. It's easier for users to sign up for Web Push than email, which results in higher opt-ins than email. Higher conversion rates. Studies have shown that web push notifications have 30 times higher conversion when compared with email. Sends customized information for a defined audience of customers based on your shop's data. Improves communication with the customer, becomes more narrow and efficient. Help fight information lost via email, for spam or junk mail reasons. Your shop will have a distinctive and more professional touch than your competition. Simple notifications that can make a difference when the customer is making decisions. Reduce the time spent on customer support. Significant increase in your sales conversions with the included functionality of the abandoned cart reminder. Shows relevant notifications in the customer's browser with the ability to customize the information sent (title, message, URL, icon, mode of delivery, among others). It allows you to configure personalized automatic notifications for each of the order statuses configured in your store, with the option of using dynamic content tags to further enrich the message and/or title of your notifications. Specific customers by name or email. Device with which they subscribed. Platform with which they subscribed. Last date the customer was active. Number of sessions recorded in your shop. Registered or not to the newsletter. Registered or not to the Opt-in. Total amount purchased in the shop. Total number of products purchased in the shop. Position in the ranking of best customers. Total number of valid orders. If the customer has purchased a certain quantity of a specific product. If the customer has purchased a certain quantity of a specific category. If the customer has purchased a certain quantity of a specific manufacturer. Abandoned carts with a certain time and amount. From a certain date of registration to the shop. Until a certain date of registration to the shop. Preferred language of the customer. Shop (in case of using multi-shop). Time elapsed the cart was abandoned. Minimum amount of the cart. Time elapsed since sending the previous notification of abandoned cart. The option to generate a discount coupon or not. Validity time of the discount coupon generated. Minimum amount of the cart to apply the coupon, including or not taxes and shipping costs. Amount or percentage of the discount. If free shipping will apply. Configuration for a welcome or thank you notification for accepting notifications. Configuration for personalization of visual effects of the notifications. URL for configuration of scheduled tasks (Cron Jobs). Option to clean outdated notification records depending on their current status and date of creation. Administration panel for notifications, subscribers and notification campaigns. 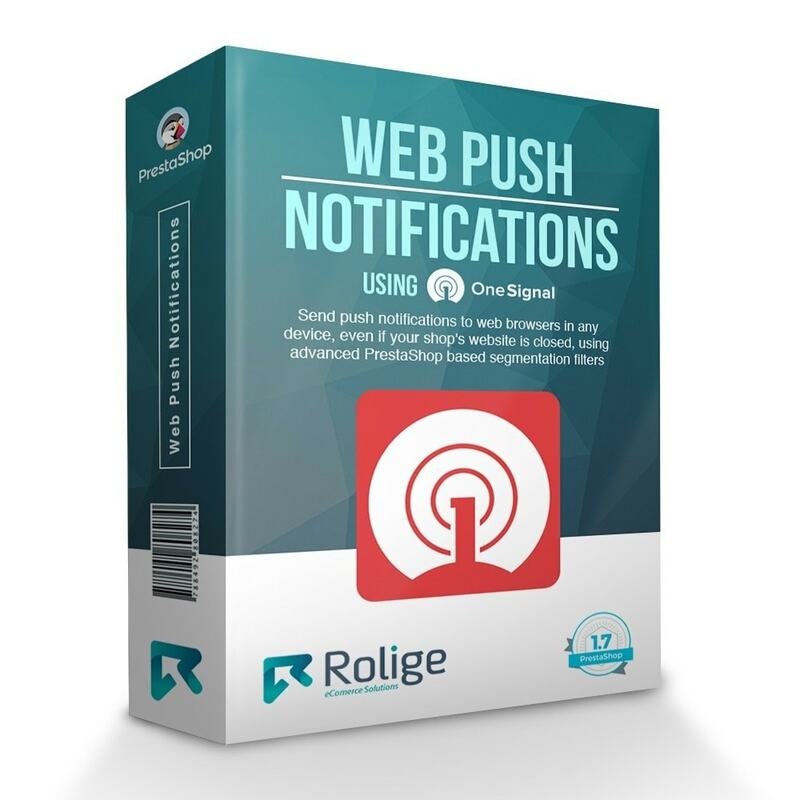 Currently OneSignal is a free service for sending push notifications to the web browser, and in order for this module work it is necessary to have an active account or create a new one on its official site. Users previously subscribed to their shop notifications through OneSignal will not be compatible or cannot be imported into this module. The customer is kept informed at all times in real time, without having to check his e-mail, or never being informed for spam or junk email reasons. The interaction from the shop to the customer becomes much more dynamic effective. Avoid making excessive use of personalized notifications that push the customer to block web notifications from your domain. Displays shop notifications in the client's browser (Alerts type web notifications), which keeps the client informed in real time of the most important events.